Spring is finally settling in. The breezes are warm, the rain showers are frequent but most importantly, spring vegetables are filling up the markets. The timing couldn’t be better. 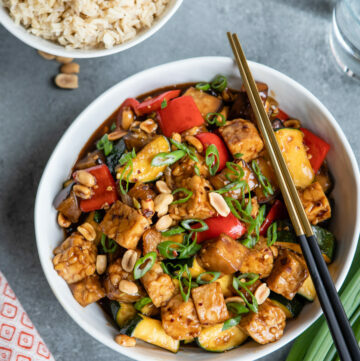 After a long gray, cold winter, fresh vibrant veggies are like a balm to the soul and a comfort to the eyes. 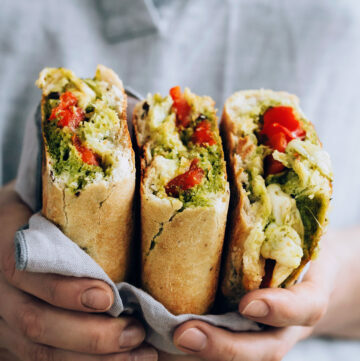 Browsing through the seasonal offerings gets my creative cooking juices flowing and I just wish there were enough days in the season to try all of the springtime recipes out there. 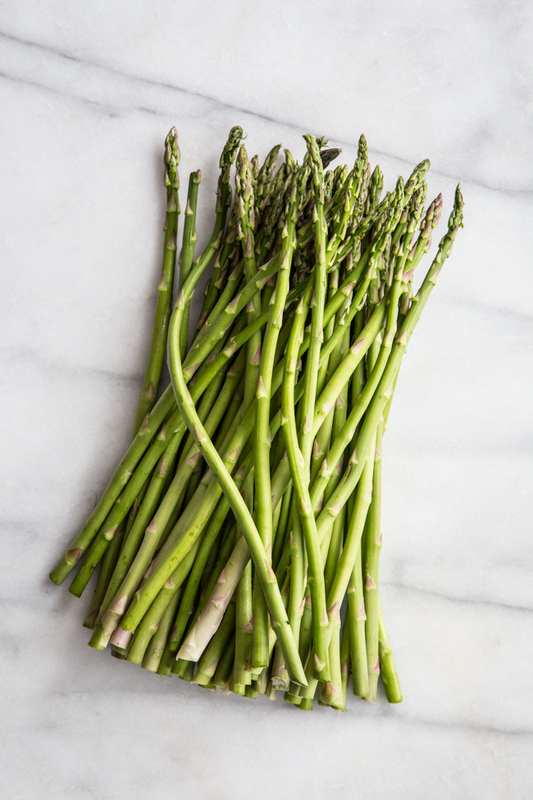 Today, I’m going to be focusing on my number one favorite spring vegetable: asparagus. Asparagus can be prepared in a variety of ways, from steamed, to roasted, to sautéed, and even raw. But have you ever made a batch of Asparagus Fries? That’s right, baked asparagus fries! 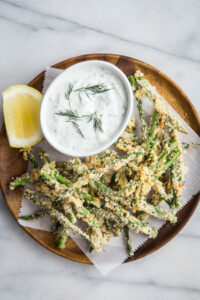 These asparagus fries are gluten-free and go perfectly with their lemon yogurt dipping sauce to make one satisfying side dish to accompany just about any meal. 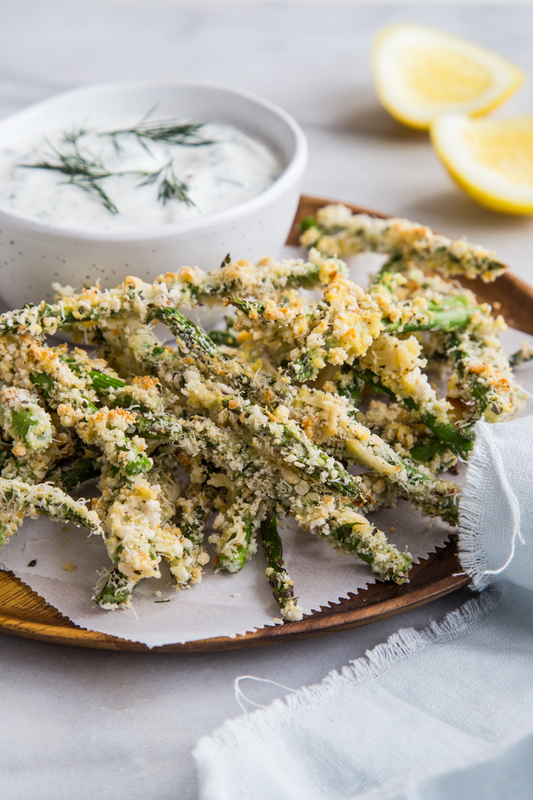 To make these crispy asparagus fries, first start by trimming thin, tender asparagus and cutting the spears in half. The spears then get dredged in coconut flour, egg, and a gluten-free panko and parmesan mixture. 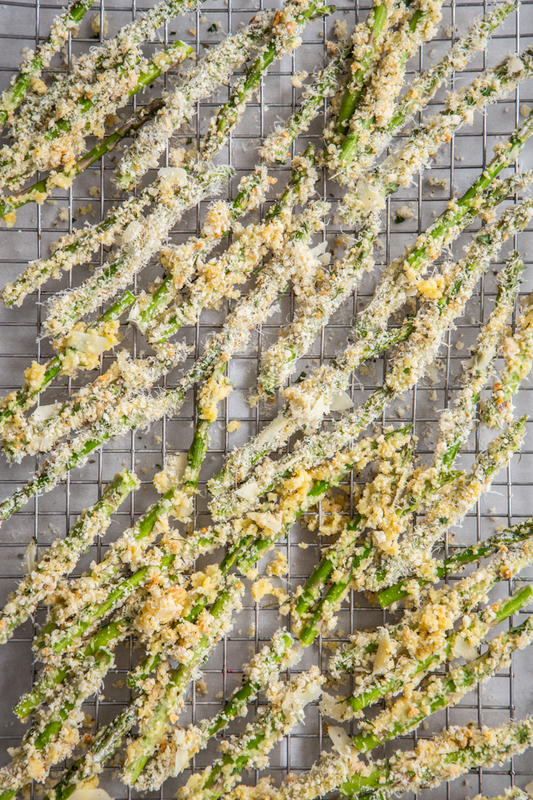 The asparagus fries are roasted on an oven-safe wire rack to ensure that the fries become evenly crispy. The asparagus gets tender, but the gluten-free panko coating gives these fries a satisfying crunch. Baked asparagus fries are a wholesome alternative to traditional deep fried French fries. They are crispy, yet tender and the asparagus brings fiber and antioxidants to the party. 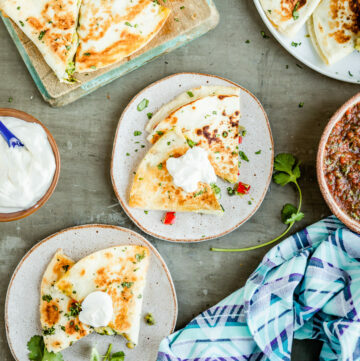 The Greek yogurt dipping sauce has a punch of fresh lemon and herb notes from the dill. All around, these Asparagus fries are my new favorite side dish going into grilling season. 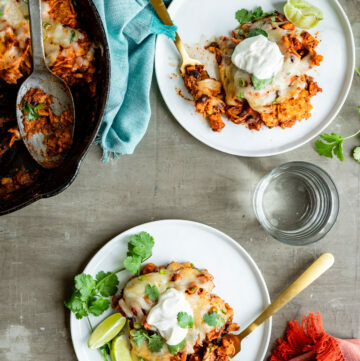 A side dish I can feel good about. Preheat oven to 425°F. Line a baking sheet with parchment paper and top with an oven safe wire rack. Spray the wire rack lightly with an oil mister or non-stick spray. Cut the tough ends off of the asparagus and cut spears in half. In a shallow bowl, mix together the parmesan, panko bread crumbs, salt, pepper, and Italian seasoning. In a second bowl, whisk the eggs and one tablespoon of water with a fork. 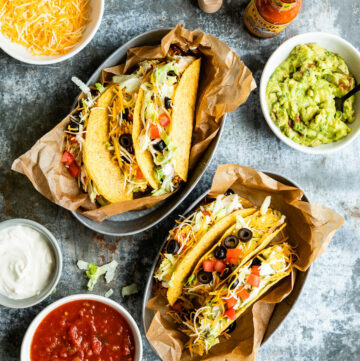 Place coconut flour into a third bowl. 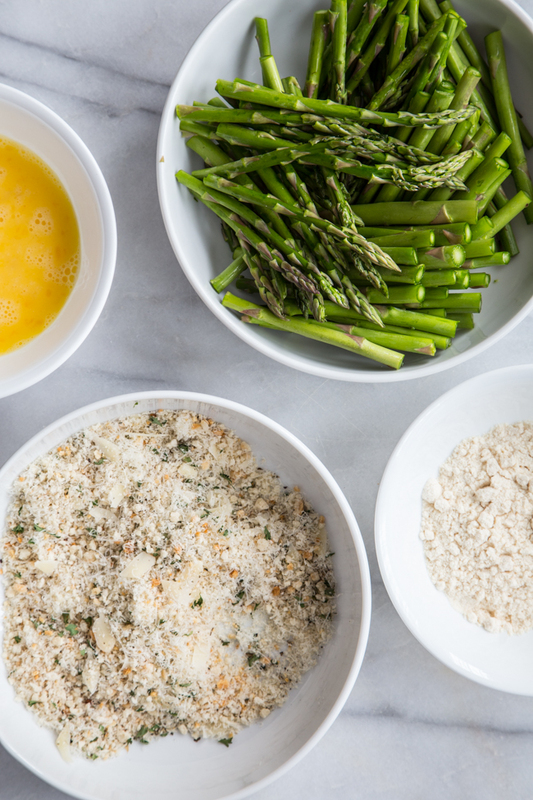 Dredge the asparagus spears in the coconut flour, then in the egg mixture, then in the panko mixture, evenly coating the asparagus with the bread crumbs. Place the coated asparagus onto the prepared wire rack. For extra crispy fries, spray the asparagus with oil before baking. Bake for 10-12 minutes, or until the asparagus is tender and golden brown. While the asparagus is baking, stir together the yogurt, lemon juice, dill, and salt and pepper. 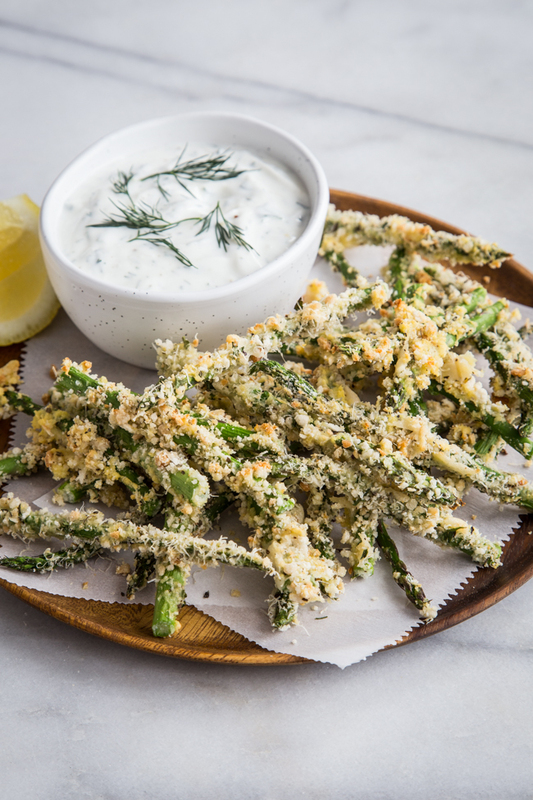 Serve the asparagus fries with dipping sauce.